A KOTOBUKIYA Japanese import! Next up in Kotobukiya's amazing line of Star Wars ARTFX+ Statues, bringing the heroes and villains of the Star Wars universe to life in dynamic 1/10th scale statues, is a fun 2 Pack capturing a pair of the most popular (and diminutive) characters in sci-fi. Coming to you directly from Star Wars Episode V: The Empire Strikes Back is the YODA & R2-D2 DAGOBAH 2 PACK! Having exiled himself to hide from the evil Empire, the former head of the Jedi Order waits on the swampy planet of Dagobah where one day a young Jedi hero will find him. And when Luke does arrive he's accompanied by R2-D2, his trusty blue and white astromech droid. This 2 Pack brings together these very different characters so you can recreate scenes from the film, and they look like they stepped right out of the movie. R2's paint and deco reflects his dirt and mud-covered appearance from his time spent on Dagobah, while the wrinkled and hunched Yoda wears his ragged robes and leans on his sturdy gimer stick cane. This pack includes multiple interchangeable parts for both figures so you can display R2-D2 standing on two legs or three, and Yoda with arms crossed and eyes open or reaching out with the Force with his eyes closed in concentration! 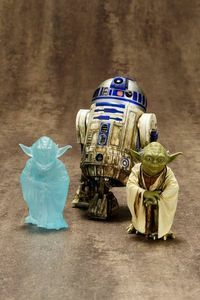 Lastly, there's even a special bonus, a translucent spirit version of Yoda. Yoda stands 2 ½ inches tall and R2-D2 over 3 ½ inches tall in the ARTFX+ 1/10th scale. This 2 Pack is a must-have for Empire Strikes Back fans, and will give you great new options for your ARTFX+ Star Wars display! Search Results Found 6 items. Showing items 1-6. Narrow by publisher: ---ArtFX/KotobukiyaGentle GiantKoto Inc.
--- ArtFX/Kotobukiya Gentle Giant Koto Inc.
Legal Notice: Entire contents trademarked (® or TM) and copyrighted (©) 1986-2019 by Things From Another World, Inc. and respective copyright and trademark holders. All rights reserved. Page rendered at 2019-04-23 11:07:00 in 0.492 seconds.